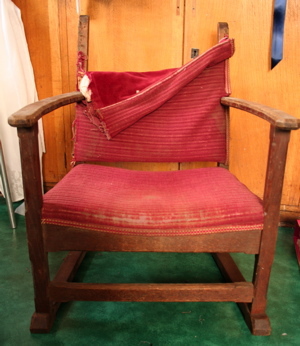 This isn’t the £5 Regency number, but is the c1900 upholstered chair for display, also from the depths of Dust World. Clearly it needs a little work before it comes to hang out with Maud and my finery at Origin. The plan is that it will be a joint effort of will, skill and frustration between myself and moonlighting upholsterer and owner of Harlands Organic Furnishings, Lisa. I say moonlighting as she is busy launching her business, dashing about the country, uploading new and lovely things to their website and is very kindly doing my chair when she should by rights be asleep. Thank you Lisa! 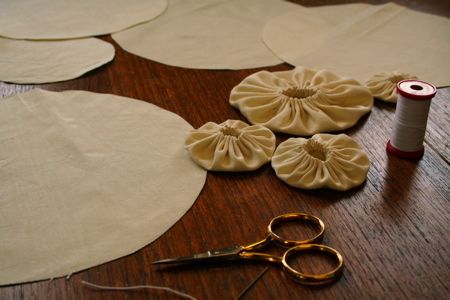 I am working on hand-constructed fabrics to use to cover the chair – three different designs on seat, front and back. One of them will be the beloved gathered circles type, in progress here. I am using cream ribbed silk vintage curtain fabric which I was given years and years ago and will render the chair so precious that I wont dare sit on it. I do think it will be stunning and am really excited about it. However, it will never be ready for delivery to Lisa for her to work her magic if I don’t get on with my stitching right now. Your treasures from Dust World are lovely. I can’t wait to see the chair finished.